Bubble for Android and iOS is designed to make it easy to initiate and participate in conference calls. The software works as advertised, according to CIO.com app reviewer James A. Martin, but it doesn't have many advanced calling features. Bubble is a new, free app for Android and iOS that makes it easy to initiate and participate in free conference calls. You don't get a lot of conferencing features, and Bubble is by no means the only app of its kind. It is easy to use, however, and there are no limits on call length. Bubble, from United Arab Emirates-based developer Riva FZC, is billed as a "PIN-less" conference call service — which is only half true. Each call you set up or participate in does indeed have a dial-in PIN, but if you use the Bubble app to initial the call, it dials your PIN for you. Otherwise, you still need to plug in the PIN. When you install Bubble, you're asked for your name, email address and mobile phone number. To schedule a new call, you enter the participants’ email addresses. In my tests using an iPhone, Bubble didn't request access to my contacts, so I had to manually enter participant addresses. That's not a huge downside, unless you're inviting a lot of people. In six countries, your conference calls get a local dial-in number. Participants don't need Bubble to join the call, but as mentioned, if they don't use the app they have to dial the number and enter the PIN. Call quality in my tests was good. 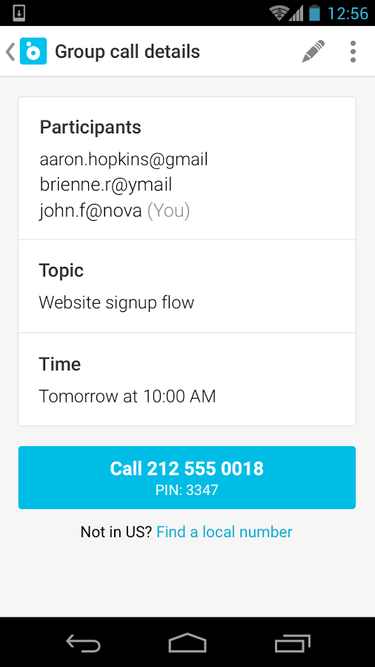 Bubble automatically sends you smartphone alerts (if you let it) and emails to remind you of upcoming calls. It can also automatically email Google Calendar entries with dial-in info, which is a nice touch. If all you need is a simple, no-frills service, Bubble should do the trick. Be aware, though, it lacks some features that are common in other conference calling apps. For example, the free MobileDay app for Android and iOS lets you join conference calls simply by pressing a green phone icon; the app then dials the number and PIN for you. You can also use MobileDay to send text and email messages to other conference call participants to let them know you're running late. UberConference for Android and iOS, also free, integrates with cloud services such as Evernote Business so call participants can view and edit Evernote files during calls. If you pay for UberConference's $10 monthly plan, you get your own local phone number, and you don't need a PIN to dial in. I like Bubble’s clean, simple interface, but I'll still probably use a conference call service with more features and functionality.